And who would win a rope pulling contest? 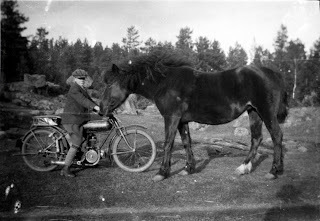 I am fairly sure the motorbike wouldnt manage to pull the Horse even if the Horse only represent one horsepower, how come this reverse mathematics? OK, this is not a US made bike but I just love this pic.